Frost in mid-September...that's just sad. What? 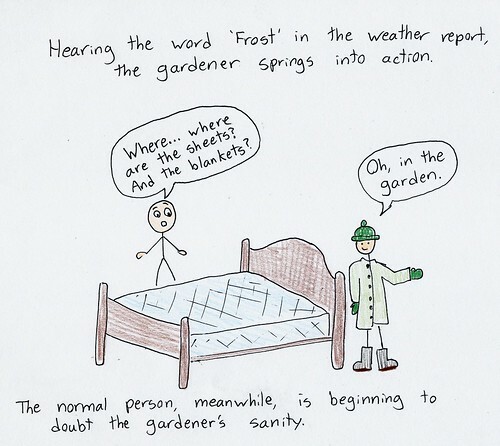 I thought the gardener was the normal person. That's exactly the way it is at my house, too! Hard to believe frost already! It was hot and steamy here today, but we expect 50s in the morning, we are in NC. Just found your blog, good reading. Danger Garden, well, turns out we dodged the bullet, so I think I've got another couple weeks! Yay! Um... I wouldn't rely on your idea of "normal"
I know, right? Plants before beds! Welcome! Glad you are enjoying the blog. A lot of my family is in NC... I wouldn't mind your short winters, but I don't mind missing your hot, hot summers.